All New Key Code Entry Locks and Keys will be shipped within 7 business days of order. 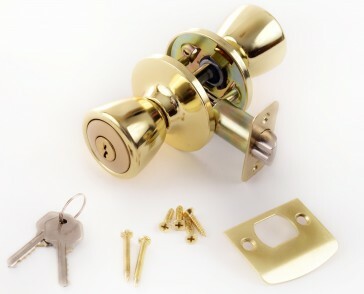 These locks were brilliantly designed to meet the highest standard of security yet they are very easily installed. Clear, easy to follow instruction manual, drill templates, mounting hardware, and two keys are included. Its traditional brass finish will add the perfect decor to your front door. We carry custom key codes for no additional fee. If you need a key code that is not listed here, please call our office 212-533-0090 or your account manager to place a custom order. - High quality contractor (reo) keyed alike Knob Locks These locks were brilliantly designed to meet the highest standard of security yet they are very easily installed. Clear, easy to follow instruction manual, drill templates, mounting hardware, and two keys are included. Its traditional brass finish will add the perfect decor to your front door. Adjustable fittings Fits a 2-1/8” diameter bore, 1-1/4” to 2” door. Backset latch adjustable from 2-3/8” to 2-3/4” Set to the following key codes Keycode: 11635; 13226; 14334; 21121; 21235; 22351; 22435; 23255; 23323; 23737; 25223; 25326; 25345; 32135; 32421; 33535; 35241; 35435; 35453; 35542; 43235; 44535; 44635; 46637; 52534; 54335; 63542; 64445; 65432; 66435; 67767; 75657; 76567; 76667 We carry custom key codes for no additional fee. If you need a key code that is not listed here, please call our office 212-533-0090 or your account manager to place a custom order.